November continued to be a fun month of fishing, and December is treating us well! Same as the last couple months, we’re still catching good numbers of fish. 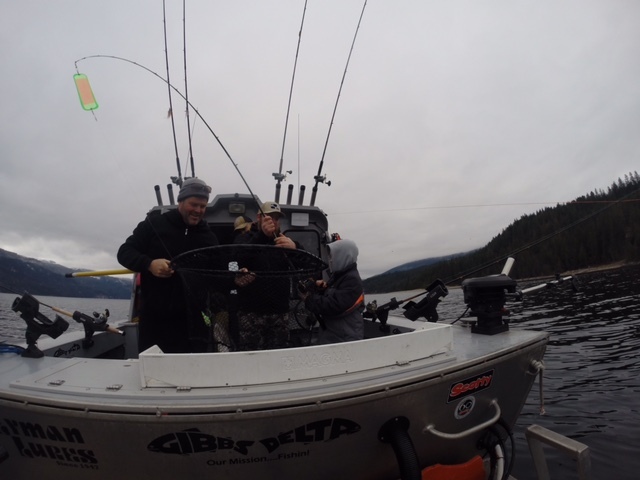 Most of our groups have been hooking into 10 or more fish each day, which has kept it exciting. Rainbows between 2 – 5 Lbs and Bull Trout between 2 – 10 Lbs have been the norm. We’ve had lots of family groups joining us the past few weeks, and these fish are perfect for the young ones as well as the older ones. It’s always a rewarding feeling, watching the younger children catch their first fish or biggest fish. The weather for the first half of December has been great. Still need the heated boat, but it’s been very comfortable fishing for the past couple weeks. Looking forward to what the rest of December will bring. Still have a few dates open between the holidays, if anyone is looking for something to do. Also have some gift certificates available for that last minute shopper. We’re still getting out on the river these days. The last couple weeks of mild weather and no snow has been perfect for drifting the river. Just have to dress for it. The fish have been co-operating as well. We’re still managing to get some fish on the fly rod, which has been fun. Mostly swinging streamers at this time of year, although the nymph set-up has produced some good ones as of late also. Also having some good days with the spinning gear. Both from shore and from the boat. The usual Columbia River Rainbows between 2 – 4 Lbs have been pretty consistent. If the weather continues to be nice, we’re looking forward to many more days on the the river this winter. 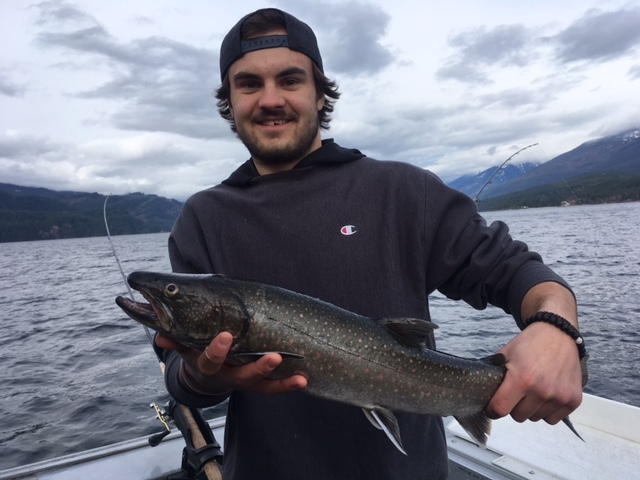 Both Upper and Lower Arrow Lake have been producing some good fish lately. We have managed to get out a couple times on the Lower portion and have seen some quality fish coming in. 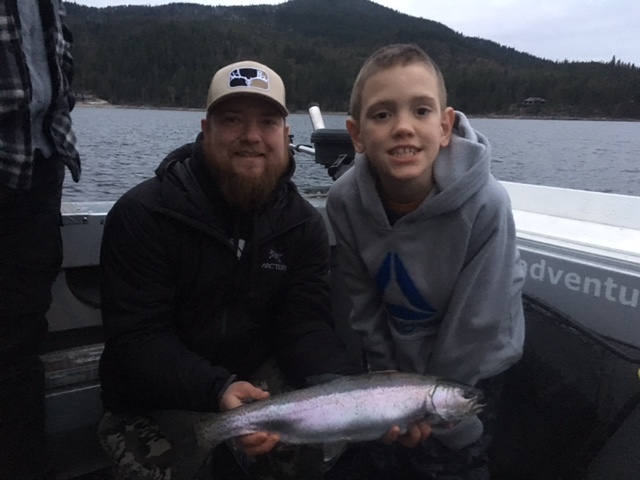 Rainbows up to 15 Lbs and Bull Trout up to 15 Lbs have been caught recently. Looking forward to spending some more time over there this winter. On the lakes, we have been running the usual set-ups. Flies, plugs, and spoons have all been working well. Our Rainbows have been coming in on the usual Bucktails. The standard patterns for this time of year are: #203 (november special), 210 (bleeding gill), 214, and 215. The 326 has slowed down a bit, but is still catching a few. And for anyone who doesn’t have the color list, its been mainly the black & whites, grey & whites, and now some purple/white patterns. Also, having some of our best luck on smaller spoons with gold colors. Gibbs Croc spoons with gold and orange have been killer. 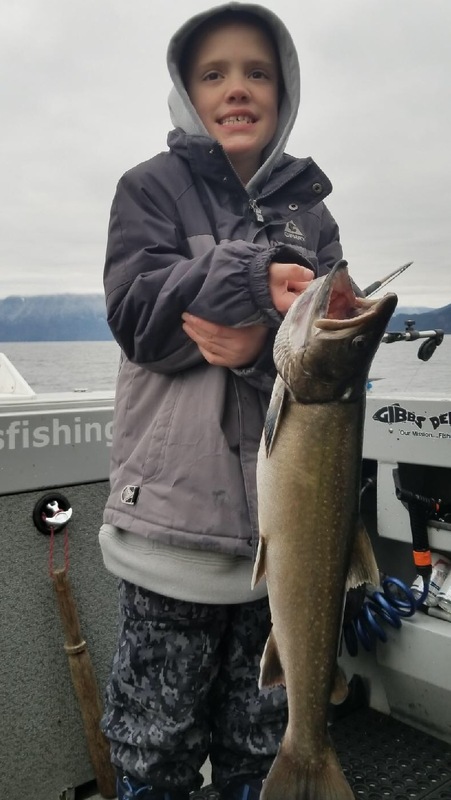 And for the Bull Trout, we’ve been catching mainly on Highliner flasher with glow hoochies, or some of our favourite plugs on the down rigger. Constant depths have been 120 – 160ft. And on the River, we’ve been catching most of our fish on wooly buggers and streamers on the fly rod. Or, bottom bouncing with bait on the spinning rod. Stay tuned for more Winter reports coming up.